Where to begin. That’s the key. A staple in my kitchen is a slow cooked pork shoulder. You can cook this in a slow oven, but for us, simmering in a slow cooker has made more sense. I often cook it plain and unseasoned, to put it in a variety of recipes, but other times I season it, and then feature that flavor. Unseasoned I usually refer to it just as shredded pork, since, from what I see, the phrase Pulled Pork often refers to shredded pork further simmered in a sauce, with that flavoring. 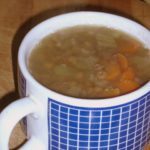 Another staple is lentil soup. I make that all the time, it’s a wonderful easy lunch, and I try to regularly vary it to keep it interesting. And obviously one way to do that is to use the seasoned meat from the freezer! 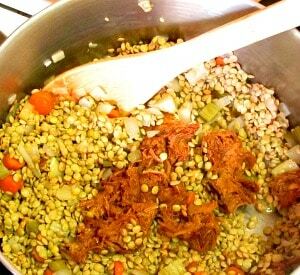 Simmer another ten to fifteen minutes to blend the flavors, and let the lentils soften further, then serve. Confession – I had planned to add some chopped cooked greens for that last stage. I made the soup, took all the pictures, sat down to eat it, noticed halfway through that I’d forgotten the spinach… Well, it was good without it. It would be good with it, too. This is a great place to add frozen chopped spinach, or chopped green muffins, or chopped fresh escarole or chard or… even cabbage. Whatever soup greens you have on hand. Go for it! 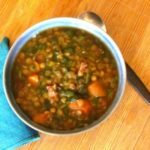 Lentil Soup with Pulled Pork - use already seasoned cooked pork to add flavor to a simple lentil soup. Great way to make a week of lunches from leftovers! Heat oil in a soup pot. Chop onion, carrot, and celery, and add to pot, saute until softened. Add lentils to pot and stir. Chop pork into bite sized shreds, add to pot and stir. Add water, and cook 45 minutes, until lentils soften. Add broth (or more water) and adjust seasoning to taste. 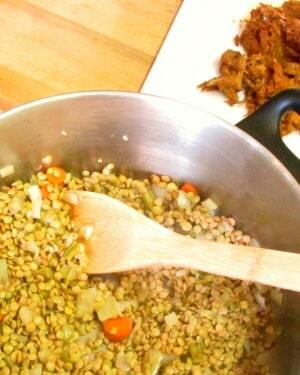 Simmer another 10 to 15 minutes to blend flavors and further soften the lentils. I love lentils! This recipe looks delicious and I can't wait to try it. There are times when I too feel like posting a recipe that doesn't state the exact quantity. Just gauge and go according to your preference is what I'd like to say!!! :p But yeah, I too realize that when looking at new ingredients or dishes, it's difficult to gauge just because I'm unfamiliar with what it's supposed to taste. Ok, ramblings aside, love that you added pulled pork into the soup. Yum! It can be tricky. We like more hot pepper, for instance, than many people, so I try to give a sort of minimal amount and say "Or to taste" (and then Rich tells me it's bland... LOL) SO, OK, seasoning we know... But maybe you don't have four ounces of pork left. Can you use just three? Sure. Can you go ahead and use five, instead of carefully keeping that smidge? Sure! But... you have to already know how to cook to know which recipes you can do this to... and that's the trick. (Don't be so casual about a souffle!) So I'm trying to give someone starting to cook (or to cook these foods) enough help to begin, while helping them understand what variations they can make - and I'm probably confusing everyone ;-) - but... And thanks! 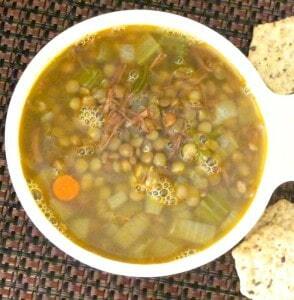 I love lentil soups. We don't eat pork. Can you suggest any option for pork in this recipe? I too am so guilty of expanding too much on a recipe without first providing guidelines. Thank you so much for giving a complete recipe with all the details. Looks like a great thing to have in your fridge for a long wintery weekend. Isn't it easy to do? But I have to judge my audience - and while many are highly experienced cooks, many are not. And in many ways, the less experienced ones are the ones I'm writing for. 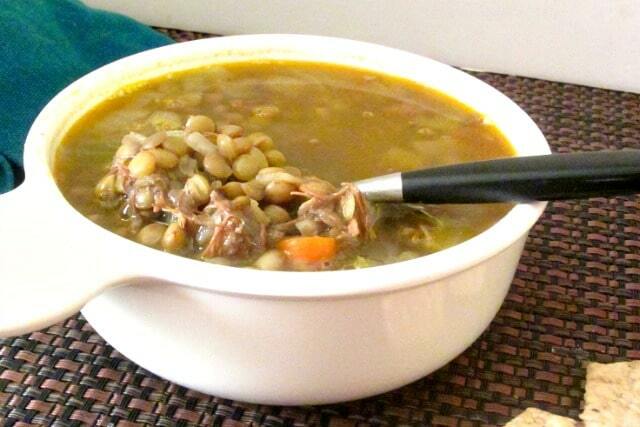 It was such a good soup in that nasty cold weather we've had lately... Easy, and warming. Thanks! I don't think I have ever had soup with pulled pork in it. This is an idea I could dig into! That's the reason I had not used that term before, but always carefully said "Shredded" pork. But I've seen enough use of the term to mean "tender cooked pork in a spicy tomato sauce" that I gave up and went with it here - but I'm happy to have clarification in the comments! Normally I do just use it in shreds - but in the soup you probably really want to chop it, just to make it manageable... 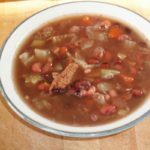 In the original post I touch on the differences of opinion about the Right Way to cook the meat. My usual disclaimer - Authentic 21st Century New York cooking here... (I have friends in North Carolina. I'm not going *near* the barbecue debate!) It's a good recipe - and certainly not what you'd get in the South. In this case, as I mentioned, I used water to start the lentils cooking, then more water with some ham base. When I cook a pork shoulder like this, I usually go ahead and then make stock - bone broth - from the bones and scrap, and then use it for later soup and cooking. If I'd had that handy I'd have used it. Otherwise, really, I'd have used chicken broth, or vegetable - or even water. The other ingredients in this recipe have enough flavor that it's still pretty good without broth! I would not use beef or mushroom, because they can be dominant, but others work well. 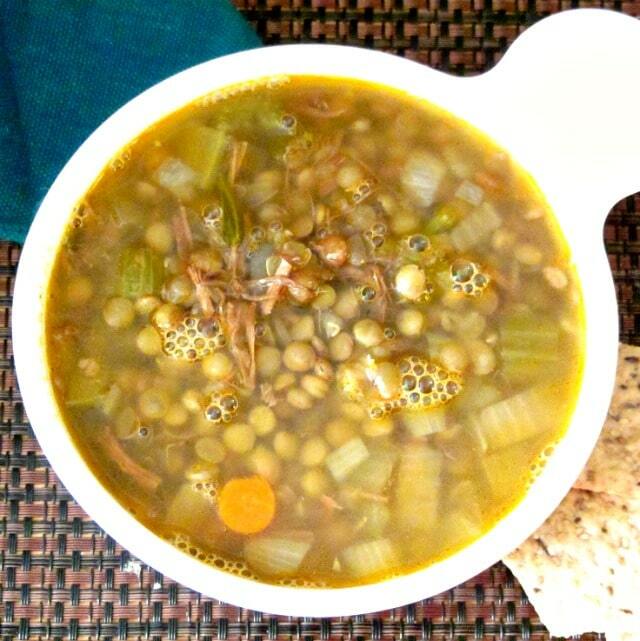 You want green lentils for this - either them or or brown, whichever you have. Red lentils are sold split. They cook much more quickly and have a more delicate flavor, and do not substitute well for the others. Enjoy it!